Nothing beats the comfort of a hot bath or shower after you’ve been drenched by rain or pelted by snow and ice. But when a weather or natural disaster emergency prevents your access to safe running water, life as you know it can change in an instant. If your source of water is a private well, a power failure could disable the pump that delivers water to your tap. Being on “city water” does not protect you from this type of emergency; local authorities could issue a warning not to drink or bathe with municipal tap water. For example, as this article was being developed, the Washington DC water utility issued a do not drink advisory instructing residents of a small area of the city not to drink, cook or bathe with city water due to reports of a petroleum smell and contamination in the water (see media report). Emergency handwashing station recommended by CDC. Credit: US Centers for Disease Control and Prevention website. How would you manage to have drinking water or to stay reasonably clean under those circumstances, especially for an extended period of days? The US Centers for Disease Control and Prevention’s (CDC’s) website has some important recommendations for personal hygiene under emergency conditions. Note: If using high-strength bleach, reduce the volume used from 2 tablespoons to 1 tablespoon + 1 teaspoon. One of the most important measures you can take to stay healthy in a water emergency is to keep your hands clean. 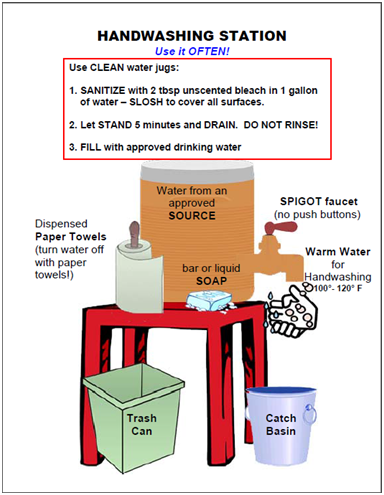 CDC describes handwashing as a “do-it-yourself” vaccine against germs. Handwashing not only helps remove germs from your hands, it also helps prevent spreading germs to others, especially children, the elderly and the immuno-compromised, all of whom are more vulnerable to infection. If you know for sure from communication with the local authorities that your tap water is safe for washing but not for drinking, follow normal directions for effective handwashing using soap and water. Bathing is possible under those circumstances as well. If your water is declared unsafe for washing, however, you should use water that has been boiled or disinfected, unless the water has been contaminated with fuel or chemicals, as seems to be the case in Washington, DC, in which case another water source must be found. A large water jug can be filled with boiled or disinfected water and turned into a temporary hand washing station (see the image above). If soap and water are not available, an alcohol-based hand sanitizer containing at least 60 percent alcohol can be used. Keep in mind that hand sanitizers do not eliminate all types of germs, and that hand sanitizers are not effective when hands are visibly dirty. Safe water—of drinking water quality—is needed for dental hygiene. If safe water is unavailable from the tap, use boiled, disinfected or bottled water instead. Open wounds should be kept clean—potentially a tall order in an emergency situation. Use safe water (drinking water quality) and soap to clean wounds. First aid providers should administer care with clean hands. Gloved hands are preferable for touching open wounds. CDC recommends seeking medical attention if redness, swelling or drainage develops. As soon as possible, a wound victim should be evaluated for a tetanus immunization. If you know of a potential water problem on the horizon, for example, if a hurricane or snow storm is predicted, filling the bathtub with water will provide a source of known water purity. The water can then be boiled or disinfected as needed. With severe weather disasters appearing to occur more frequently, we have to take our responsibility for our family’s safety more seriously; don’t be caught unprepared! Keep a hygiene disaster supply kit handy in your home…just in case. Bruce K. Bernard, PhD, is President of SRA Consulting, Inc. and Associate Editor of the International Journal of Toxicology.